RoyalEnfields.com: Could Royal Enfield's modern motor put the power in vintage choppers? put the power in vintage choppers? A wicked looking chopper with a Royal Enfield motor is featured in The Hindu. It's the work of Vijay Singh at Rajputana Custom Motorcycles of Jaipur, India. It's called the Lightfoot, and it includes such traditional touches as girder forks, obsolete front brake and a hard-tail rear. But the engine is a completely modern Royal Enfield Unit Constructed Engine! That's what is so interesting. Reader Bob Slovey notes that: "The popularity of 'chopper' builders (in the United States) has grown simply because of the popularity and easy availability of 'crate engines.' Most of the ones you see on the street are aftermarket Harley clones. These companies have made a killing in the Harley engine clone market. "I look around as ask 'Why is Royal Enfield not in the crate engine market?' Royal Enfield now has a modern, reliable engine (C5) that looks great, doesn't leak oil, and starts when it's supposed to. This would be the perfect starting point for a young bike builder just getting started and looking for something affordable and different. Don't you think? "It would be the perfect component for new builders to play with. After all, why destroy a perfectly good motorcycle just to use the engine in a custom build? If a C5 crate engine were available from Royal Enfield, it would change the industry. Young builders could hone their building skills on a less expensive component and not have to pay $8,000 to $15,000 just for the engine. "It would also go a long way to promote the RE name in ways they have not even considered. Don't think for a minute Harley doesn't know full-well the benefit they receive from the engine clone industry." I took Bob's thoughts to Kevin Mahoney of Royal Enfield USA. His response: Maybe someday. "There probably is a market," Kevin wrote me. "While we can get engines from Royal Enfield it is only onsies and twosies. Therein lies the problem. 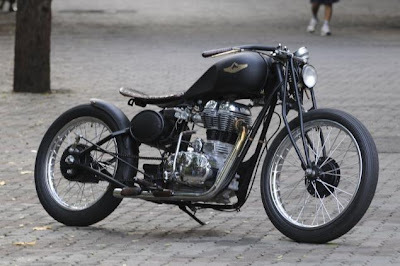 I am dying to see a great Royal Enfield chopper and a bobber myself." The Lightfoot is an example of what is possible, although The Hindu criticized the motor for looking "a little too new for an ‘antiquated' motorcycle." Maybe in India, it is too shiny. But that probably is not the case elsewhere. I think Johnny Pag is proof that your idea has some merit. His 300cc Chinese engine has 23hp against the 27 of the Enfield and 18 N m torque vs 40 for the Enfield! The Lightfoot reminds me a lot of the Falcon series by Falcon Motorcycles in LA.